A huge trend hitting the catwalks this Autumn/Winter has been The New Fetish. We must say we love this look, with the likes of Lanvin, Victor &Rolf and Louis Vuitton being our favourites. This trend is very much cracking the whip on this Autumn/Winter. Here we decided to take this fetish look and give it an Annie and the Mannequin overhaul. 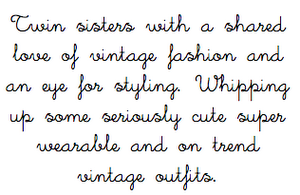 We have decided to go super vintage glam whilst still keeping a slightly riskier twist. Black layers of Leather, lace, chiffon and Faux fur creates a glamorous vintage take on Fetish. We have Entered this into the ASOS "how will you wear it" competition. With a chance to be featured in their magazine and £250 to spend on an ASOS wardrobe, we are capturing and entering every Autumnn/Winter trend "The Annies" Style.